MacKenzie Commercial Real Estate Services, LLC is pleased to announce the recent sale of a 5.3 acre I-95/I-495 Beltway interchange site in Largo, Prince George’s County, Maryland. MacKenzie Vice President David McClatchy represented the seller, Arbor Lodging of Chicago, in the transaction. Situated at northwest quadrant of I-95/495 and Arena Drive, the site was sold to Sandpiper Hospitality of Richmond, Virginia. Plans for the site include the development of a two -unit WoodSpring Suites (formerly Value Place) extended stay hotel. 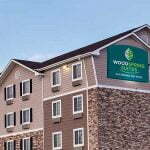 Founded in 2003, WoodSpring Hotels has become the fastest growing value segment extended stay hotel brand in the U.S. with more than 200 locations in 30 states. They are an aggressive competitor to Extended Stay America, who currently leads the extended stay field. For more information on WoodSpring Hotels, please visit www.woodspring.com. For sales and leasing inquiries contact David McClatchy at dmclatchy@mackenziecommercial.com or 410.953.0366.